The term “cole crops” refers to waxy-leaved Brassicas of European origin, of the species Brassica oleraceae. Cabbage is the most widely grown and easy to grow of the cole crops. 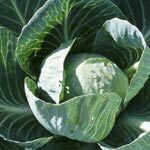 Cabbage varieties are available that mature in as little as 60 days or as much as 120 days from transplanting. The early and mid-season varieties are generally better suited for fresh market sales where small heads of 3 to 4 lbs are desired. A number of excellent cauliflower and broccoli varieties are available which range in maturity from 55 to 95 days for cauliflower and 55 to 75 days for broccoli. Cauliflower is relatively difficult to grow compared to cabbage. Failure to head properly and poor curd quality are common problems. For successful production of cauliflower, a fertile, moist soil relatively high in organic matter and nitrogen is needed. Cauliflower buttoning is the premature formation of curd, and since the curd forms very early in the plant’s life, the leaves are not large enough to nourish the curd to a marketable size. Conditions that reduce the vigor of the plant and retard vegetative growth, such as cold temperatures at transplanting, appear to encourage buttoning. Broccoli is not as exacting in its requirements as cauliflower, however, it must be harvested promptly to avoid flowering. Prolonged temperatures over 85°F during the critical period when the head begins to form result in poor head quality. In Southern New England, broccoli is best grown as a fall crop. Brussels sprouts, collards, kale, kohlrabi and Chinese flowering broccoli are also cole crops, with similar requirements, diseases and pests. Brussels sprouts can be harvested when they are round, firm, tight and of good color. Kale is hardy and grows best as a fall crop, but can be succession planted all season. Flowering kale is susceptible to tip burn during hot weather. The flavor of the leaves will be improved after a light frost. The edible part of kohlrabi looks like a turnip growing on the top of the ground with sprouting leaves over the surface. It must be grown rapidly and harvested when 1 1/2” to 3” in diameter or it will become tough and stringy. Early plantings of cabbage and other cole crops are generally made by setting out transplants grown in greenhouses or cold frames. Transplants should be four to six weeks old at field setting; and, for cauliflower and broccoli, transplants should be produced in greenhouses with a minimum temperature of 55°F. Excessive cold, transplant stress, inadequate fertility or other sources of stress in early stages can cause cole crops to go to seed without heading. Transplants with thick stems are likely to head prematurely or button. Midseason and late plantings can be transplanted or direct seeded. If cabbage, broccoli or cauliflower are direct seeded, two to three weeks should be added to the number of days to maturity. Generally, coarse textured soils (sands, sandy loams, etc.) are favored for early plantings because they can be worked earlier in the spring and will warm up faster. These soils are also less likely to become waterlogged under rainy spring conditions. Finer textured soils which have a greater water holding capacity can frequently be used to advantage for producing later crops.